If you’ve ever spent time in the south, you’ll recognize plantation style shutters as a traditional window covering that filters light, but allows a breeze to come through. As an addition to a room in a log home they provide a rustic charm and functionality to windows or patio doors. Plantation shutters come in many styles and configurations. They are best made of basswood, which is recognized for its strength and resistance to warping, twisting and bowing. Because even interior shutters are exposed to a lot of ultra violet light, basswood makes an ideal material. Because basswood is known for its stability and straightness of grain it is almost universally used for drafting tables. Shutter panels in standard sizes may be ordered unfinished with a standard 3” louvers from Shutterland website, which provides hanging hardware and sizes for most applications. 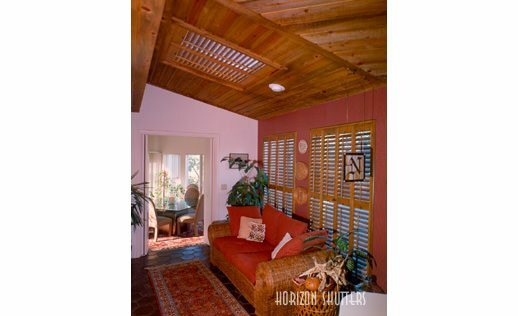 For custom plantation shutters you’ll want to check out Horizon Shutters’ amazing website. 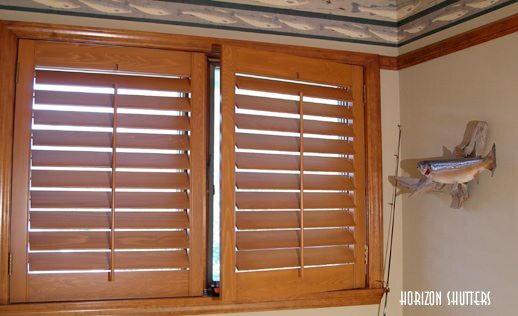 They create plantation and traditional shutters in custom sizes, with louvers as wide as 4 ½” wide. You can see how they will look with a unique “360 view” and “rotate louvers” to get a virtual look at how they work. Also on the site are two virtual design room settings to play with different configurations and colors.